Tajchy – artificial water reservoirs built in order to provide energy for mines – are the treasures of the region waiting to be discovered. This is particularly true of their origin, historic and technical value as well as their leisure activities potential and popularity among both locals and tourists. The most famous one is Počúvadlo Lake or, for short, Počúvadlo. It is one of the largest and most beautiful reservoirs, being a common starting point to the legendary peak of Sitno, as well as a suitable place for swimming for both adults and children by boat and rented pedal boat. There are numerous inexpensive places where to eat as well as accommodation facilities and guest houses of tourist standard. 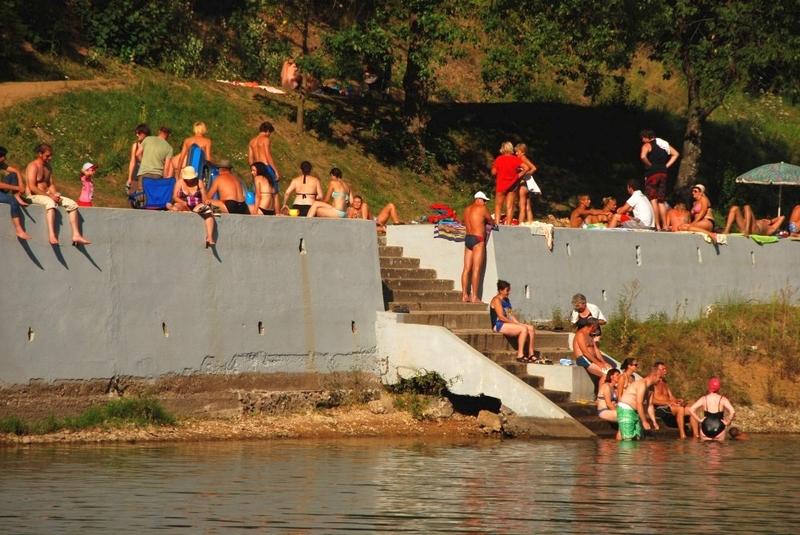 Because of their milder banks, Vindšachta and Richňava in Štiavnické Bane and Kolpachy in Banský Studenec – the place with perhaps the most sunshine during the day – are popular locations for bathing as well. The people of Štiavnica enjoy swimming in Vodárenská and Klinger (both accessible by foot – 15 minutes from the town centre) or Belá tajch. All of them are favourite places where to go for romantic walks. Visitors can enjoy peaceful and beautiful countryside, especially in spring and autumn. However, if you long for solitude, quiet and serenity, try visiting Halča or Bakomi – with often not a living soul around. Another beautiful place is Evička tajch. Suitable locations for swimming include other reservoirs in the valleys visited mostly by the locals. Ottergrund, which lies close above Štiavnica, offers a beautiful view. It can be reached by the Educational Trail of Milan Kapusta with lovely viewpoints of the town. In winter the lakes are a venue for skating – Vodárenská enjoys popularity among meditative ice-skaters, while Červená Studňa is the right place for power ice hockey players. Don’t hesitate to join them – they will gladly welcome you for sure! The in-season temperature of the water reservoirs is usually about 24 degrees. Food stalls are open according to the season – mostly from June to September. The fishermen will be happy to discover predominantly carp and trout fishing grounds in the reservoirs of Štiavnica. The Rozgrund tajch is a source of drinking water with prohibition of swimming. The Richňava tajch has been under reconstruction until September 2015.